Can you believe it’s already time to talk “back to school”? Some kids head back to school this week and some still have a few weeks of summer vacation left. 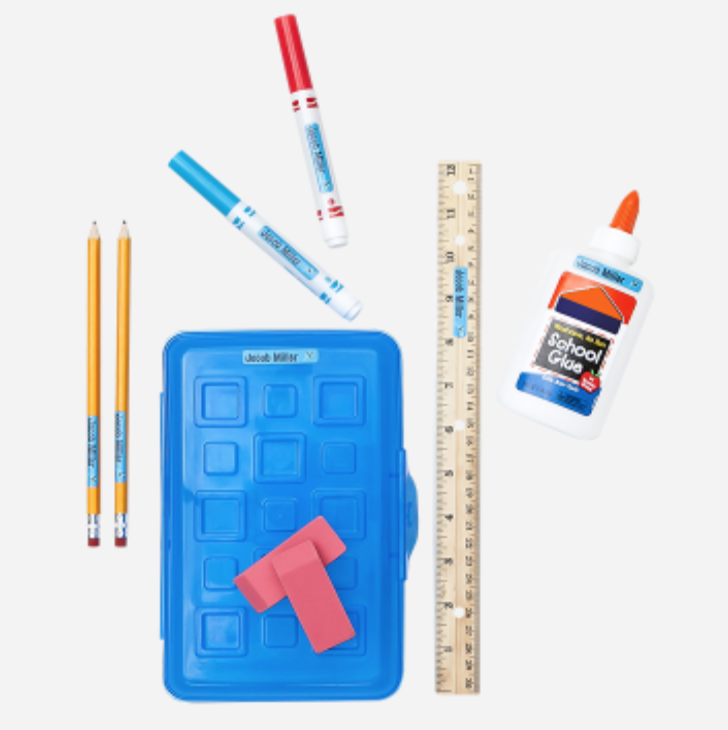 This week on the blog, we’ll be sharing all we can to make this year’s Back to School season a success. We’ll have ideas for organizing, making memories, clothes, school gear and tons of school giveaways. You can keep up with all of the posts on our Seasonal tab and all the giveaways on the Giveaway tab. We’re kicking the week off with a new favorite in both of our houses: Mabel’s Labels. Mabel’s Labels are the creators of durable “labels for the stuff kids lose!”®. The brand was created by four moms frustrated by their children’s belongings leaving home, never to return. Mabel’s Labels offers classic and special-edition collections of personalized, waterproof name labels and tags. Right now, there’s a great discount to shop Mabel’s Labels: our readers get 10% off their entire purchase with code TCM10 (through 8/31). Plus, if you purchase anything “back to school” your order ships free. What are your favorite tips on staying organized for the first day of school? 1. Adjust routines a few weeks ahead of time. Children need time to get used to new things. Start earlier bed and wake-up times a few weeks before school starts to help ease into the new schedule. Moving bedtime back helps ensure your kids won’t be overtired and falling asleep on the bus ride home that first day! 2. Practice the first day routine. Go through all the steps together from waking and getting ready on time to walking to the bus stop or driving to school. Familiarity will reduce nervousness and iron-out any timing glitches. 3. Allow time for a healthy breakfast. Nervous tummies might not be ready for a big meal so keep it light but nutritious. Injecting some fun into it can help ease nerves too – make a blueberry smiley face on that bowl of cereal or pancake. 4. Stay cool. We parents are often more nervous than our kids! Since children can pick up on our moods, keep your jitters hidden and tell your child that you’re sure they’re going to have a great first day. Chances are, they will! 5. Label look-alike items. If you or your kids have ever found yourselves puzzling over identical looking clothes or uniforms, you’ll know what a time-saver labelling can be. Use waterproof labels on clothes, shoes, bags and school supplies to let everyone know who owns what and you’ll get out the door much quicker. Cool Keds for labeling from Stride Rite. Do you have any tips for managing the back to school morning routine? Help your kids manage their own routine. Rather than wasting time nagging my kids to pack their homework or lunch, etc. I give them the tools and encouragement needed to think for themselves. At our house, my little ones use the ‘Ready, Set, Go’ Board to manage their morning routines. Every child marks off duties as they’re completed – get dressed, go to the bathroom, eat breakfast, brush teeth, etc. And if each is done without verbal reminders, they earn a check mark in my wonderful and elaborate reward system. This visual cue is very helpful for children – I’m always referring them to the “Before School Plan” as a reminder to self-evaluate how far along they are in getting ready. Non-readers can do it just as well with the use of pictures. Don’t let children make choices in the morning. I know this sounds harsh, but if you start asking everyone what they want for breakfast, you’ll soon turn into a short order cook. Serve up one breakfast item to all. Keep it simple – go with cereal and fruit if you can get away with it. Streamline lunches. I freeze sandwiches to use throughout the week, or make casseroles and soups on the weekend to throw in a Thermos when the colder weather hits. Super quick and easy in the morning. Let the little things go. So maybe your toddler and baby have to sit in their nighttime diaper a little longer than you’d like, but get those big kids out the door before dealing with the little ones. I don’t think there are any studies to indicate that sitting in a diaper for an extra half hour in the morning causes any long-term damage. Divide and conquer! Having to get your littlest ones out the door every morning so you can get your bigger kids on the bus can add a lot more time and stress to your morning, especially in wintry weather. I hire an older kid who goes to the same bus stop and is happy to do the morning pick-up and afternoon drop-off for a cool $20 a week. “Bus buddies” are a terrific investment for busy mamas. Our favorite raincoat that we label so we don’t lose is from Babychelle. Do you have any good organization ideas for all the school papers that come home? Create a dedicated area and make sure everything has a home. Each of my children has a cubby for their agendas, homework, books and papers. This is where they can also keep their school bags, gym clothes, lunch gear and a school calendar with important dates. With 6 kids in the house, what’s your number 1 tip for family organization? For obvious reasons, my kids are extremely well trained at labeling their school gear and also knowing how to hunt things down when they go missing. They pride themselves on never having lost anything to the lost and found closet for more than a few hours! Six kids means a lot of gear and a lot of expense, so my Mabel’s Labels are my cheap insurance policy. Apart from helping them identify their belongings and avoid mix-ups with lookalike items, labels minimize the chance of them losing stuff, which means you save the time, cost and hassle associated with having to re-buy items. How did you come up with the idea for Mabel’s Labels? Whenever my partners and I would get together with our young children, we noticed that toys, bottles and all that other kid stuff kept getting lost or mixed up. We also noticed that kids’ belongings were ‘labeled’ with permanent marker or masking tape with their names scribbled on – and we knew we could do better. At the same time, as working Moms, we were also looking to achieve a work/life balance. When my eldest child was diagnosed with autism, monitoring his behavioural therapy became a priority so I decided to shelve my law career in search of work that would allow more flexibility. We hit on the idea of bringing a brand new product, durable ID labels, to market. And we’ve never looked back! Now for the giveaway: One lucky winner will get to customize and receive the Mabel’s Labels Ultimate Back to School Combo. You can enter using the Gleam form below. Also, keep an eye on Instagram, this week because at some point we’ll be giving away ANOTHER Ultimate Back to School Combo pack of labels. Don’t forget that our readers get 10% off their entire purchase with code TCM10 (through 8/31). Good luck and let’s get labeling! Make sure to visit our Giveaways Page for more Back to School giveaways & visit our Seasonal Page for all of our fun Back to School posts! Love the tip of not letting your children mak choices in the morning! This NEVER is a good idea in my house…always have things prepared the night before! I like the idea of freezing sandwiches & also having cubbies for school items. Great tips! And love the labels – I never thought about labeling some of the items mentioned but it makes sense. OceanSunrise8 – I have to agree with adjusting routines a few weeks ahead of time. It's the only way for my children to get back into the school routine. Thanks for the helpful tips! I think the "help your kids manage their own routine" is the best way to get back into the school routine! That is great for public school and home school children! create and area for each kid and make sure everything has a home. I like adjusting our routines a few weeks ahead of time! It makes the first week so much easier! I also like the idea of not giving them chives in the morning. We prepare everything the night before so breakfast, clothes and bags are ready. I like the tip about practicing routines before school starts. It's good to get an idea of how the mornings going to go and how long it will take before the first day. My favorite tip is Allow time for a healthy breakfast! When rushed, it always makes for a hectic morning…we are going to try to get up earlier…and have a more peaceful relaxing morning! I like the tip about everyone having their own cubby/locker for all their belongings, will make the mornings less crazy! I like the idea of having a morning check list that each child has to check off while getting ready for the day. Adjusting routines ahead of time is great advice. I remember hating it as a kid because it meant summer was truly over, but it really does help.